Model 3 customers worldwide are reporting receiving an update from Tesla today about their reservation after logging into their MY TESLA account. The original text re-confirmed their pre-order date and indicated when the company will start deliveries. Those who don't have an account can make one by using their e-mail address used to order the vehicle. 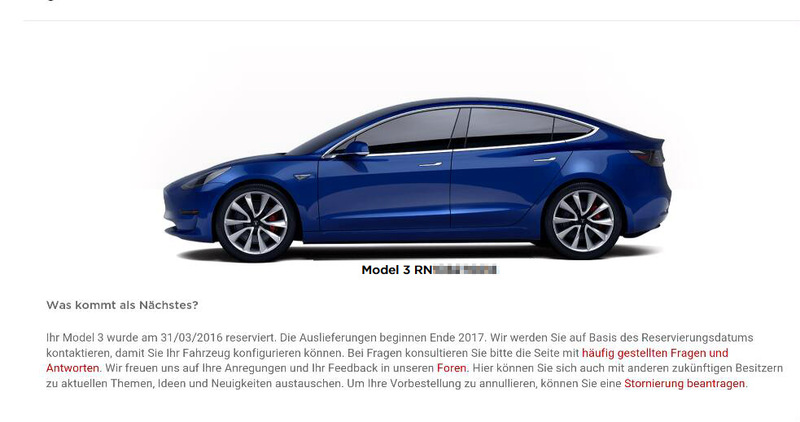 But the highlight of this update is the striking blue shade the Model 3 is featured in. Tesla will notify its future customers when they can start configuring their vehicle based on the date of their reservation. A link to cancel the order, if the customer wishes, is available as well. 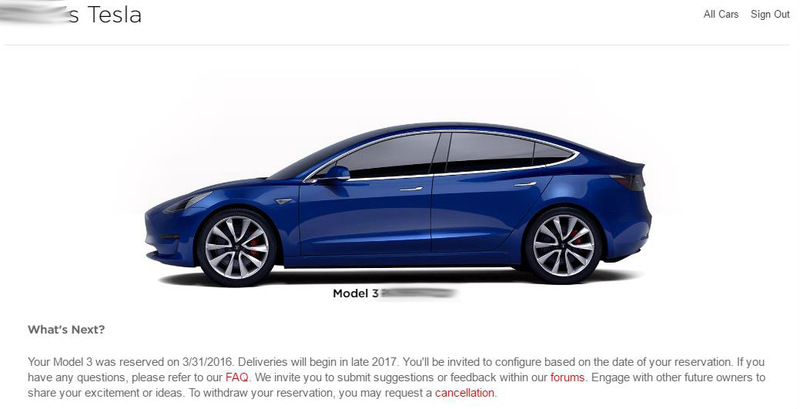 "Your Model 3 was reserved on 31/03/2016. Deliveries will begin in late 2017. You'll be invited to configure based on the date of your reservation. If you have any questions, please refer to our FAQ. We invite you to submit suggestions and feedback within our forums. Engage with other future owners to share your excitement or ideas. To withdraw your reservation, you may request a cancellation." By now, Tesla's reservations officially hold at 373,000. 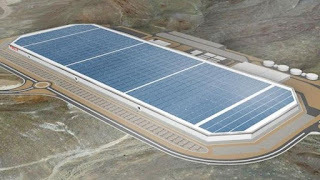 It is possible that Tesla is not so eager to add more reservations to its already ambitious production volume of 500,000 (including Model S and X) by 2018 as it is facing a 14 months window to get its Gigafactory's battery production running on time and seal the deal with all the suppliers for all the Model 3 parts. Elon Musk stressed on making sure suppliers will meet the July 1st 2017 deadline to supply parts in order to meet delivery by end of 2017. 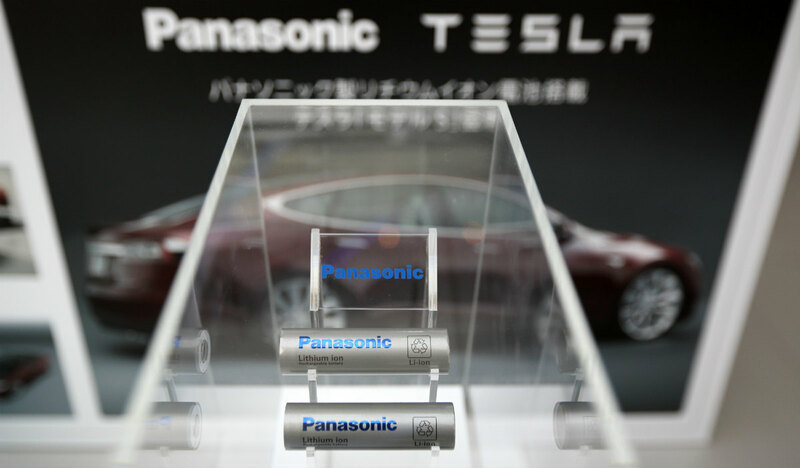 Separately, Panasonic has just announced it is ready to bring forward its investment in the Gigafactory if required to meet demand of the Model 3. "We will do our best to move up the schedule if requested," Yoshio Ito, head of Panasonic's automotive and industrial systems (AIS) division, told reporters at a briefing on Friday, adding "We just don't want to be a bottleneck." In Q1 2016, Tesla reported an investment of $131 million in the Gigafactory, 35% greater than the amount invested in Q4 2015. 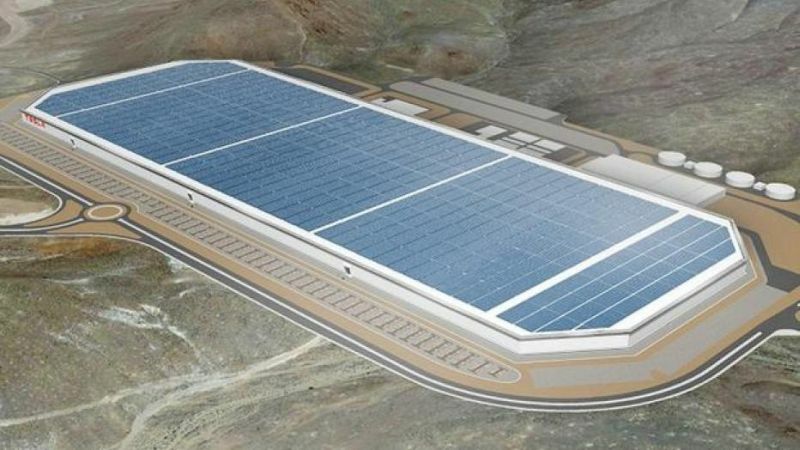 To date, the Gigafactory has a footprint of approximately 800,000 sq. ft., which includes around 1.9 million square feet of manufacturing space, becoming the biggest in the world. it will most likely be excluded otherwise there will be an overwhelming demand at those stations for charging and will cause problems. A fee will probably be introduced to gain access to that. 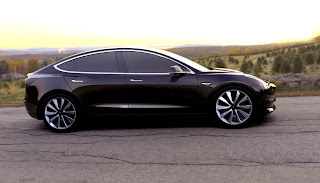 super charging is included for model 3...no charge...its on tesla website..
Hi Terry. Supercharging capability is free. But charging at the stations will probably come with a fee.